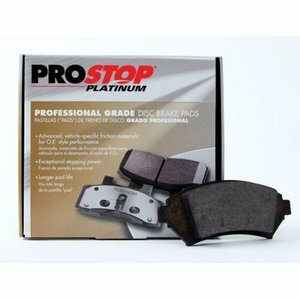 ProStop Platinum brake pads are constructed with multiple formulations within each classification and are designed to deliver original equipment performance characteristics. Designed so friction classification matches the original vehicle requirements (NAO, Semi Metallic, and Ceramic). Vehicle specific formulas deliver the pedal feel and performance of your vehicle's original brake pads. Featuring exceptional stopping power, these brake pads are constructed by advanced vehicle-specific friction materials for OE style performance. The Pep Boys Say: "This pad is our OE replacement pad. An excellent choice for the customer who wants the same feel and performance of the original."